Explore las hermosas Montañas Azules en esta excursión para grupos pequeños con un guía local. Después de un conveniente hotel o camioneta AirBnB, haga un seguimiento de los wombats y admire a los canguros, observe los koalas y cocodrilos en Featherdale, y maravíllese con las imponentes cascadas y los impresionantes acantilados. Disfrute de un delicioso desayuno y almuerzo y tome un viaje en ferry por el río Parramatta hasta el hermoso puerto de Sydney, todo incluido en el precio del viaje. Ver koalas y cocodrilos, wombats y canguros, acantilados y cascadas. This was by far the most memorable of tours for our family/friend group of 8 travelers. Communication prior to our tour was excellent. We were picked up at our hotels on time for this incredible and private tour. We were excited to see kangaroos in the wild almost immediately upon entering the park, and were able to capture some wonderful pictures of them. Breakfast was amazingly simple, but flavorful and ample. The best part was the cheery and friendly guides who presented the meal to us. Kookaburras made quite a racket and provided excellent entertainment throughout our picnic style breakfast. Scenic world and Featherdale Wildlife Park were equally fantastic, and our guide accompanied us all day. We were told stories by our guide driver that kept us laughing throughout our van rides. Lunch was awesome at a sweet little restaurant with a nostalgic feel in a quaint mountain town. Food was delicious, and we were allowed plenty of time to enjoy it. We were allowed plenty of time throughout the day to experience each segment of our day without feeling rushed. At the end of our tour we chose to ferry back on the Paramatta River for a further scenic experience. The option to be returned by van back to our hotel was also available had we not wanted to venture on the ferry. Tickets were purchased and ready aforehand by our guide. This was truly an awesome and memorable adventure. 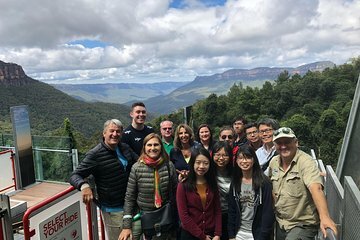 There is no tour that can possibly compete for a full day’s activity, providing every opportunity to encounter wildlife and beauty in the Blue Mountains, Featherdale, and Scenic World at this truly reasonable pricing for a private tour. We were made to feel like family by our guides, Graham(Chapo), Hayden, and even Shawn who was guiding another group on this day. Everything we did was inclusive in our tour price without a single extra penny spent. A heartfelt thank you to all the guides who we will wholeheartedly recommend to anyone looking for a true wildlife experience in the Blue Mountains. Hotel Concierges should take note to make this tour a recommendation for guests!! It was in a word, PERFECT!